Dragons director of rugby Lyn Jones says the refereeing of Pro12 matches need to be reviewed. Jones believes recent controversial decisions have put the competition's officiating in the spotlight. "There are big decisions to be made by all unions on how we can give some credibility to this league," Jones said. "We all want the best and fairest outcome and for players to decide matches." Ospreys felt they had a "clear" try disallowed in their defeat at Connacht on 27 February. Irish official George Clancy conferred with video ref Jude Quinn before making the ruling in that game in Galway. "I've been out to the Sportsground many times and we've had perfectly good tries taken away from us," said former Wales flanker Jones. Euro 2016: Who will make the cut for Wales? "Incidents have been happening which have gone undetected. We've been banging the drum for years about this, so it doesn't surprise me." Edinburgh coach Alan Solomon's was unhappy with an offside decision which he believes cost his side victory at Scarlets on February 12. 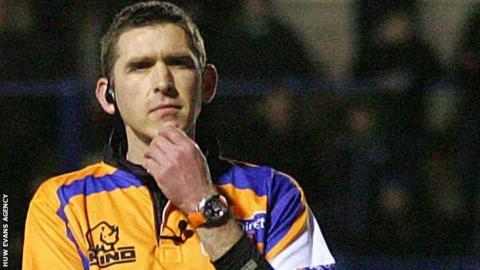 The match officials in that game were Irish referee Andrew Brace and Welsh assistants Craig Evans and Greg Morgan with another Welshman, Jon Mason, as television match official. "You can refer back to the last-second penalty for the Scarlets against Edinburgh two weeks ago. It goes on and on - it's a catalogue," Jones added. "It's a challenge for this league and always has been from day one." Referees in the Pro12 are drawn from the four unions whose teams compete in the tournament - Ireland, Italy, Scotland and Wales. But referees and assistant referees - formerly classified as touch judges - are able to take charge of matches involving teams from the country of their birth. "It would be nice to have neutral officials for all matches," said Jones. "I still feel that the best team does win. However, upsets can occur and it just needs really sound officiating for that [the best team winning] to happen." Dragons are at Munster at Thomond Park on Saturday, where they have won just once, but Jones is undaunted. "We can win there. We need to be positive and take our attacking game and intent to Munster and put them under pressure. "Get the referee on our side and get those 50-50 calls coming our way, which we all see in the league sometimes influences outcomes."